North Korean Minister: Trump's 'Declaration Of War' Means N.K. Can Shoot Down U.S. 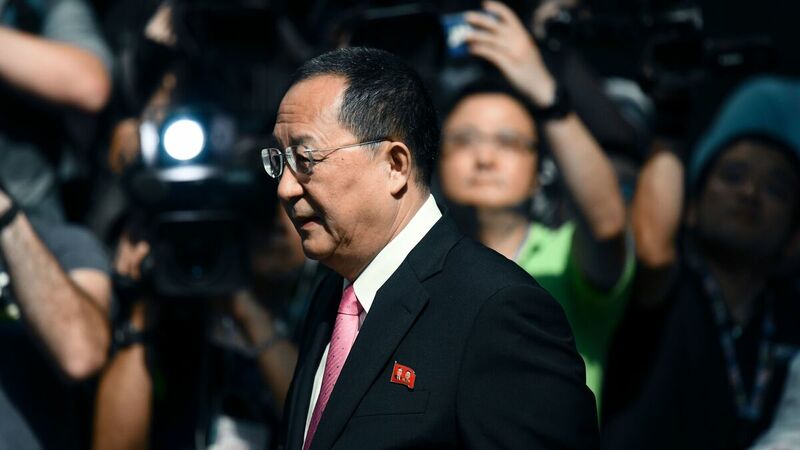 Bombers : The Two-Way North Korean Foreign Minister Ri Yong Ho says that under international law, his country can legally shoot down U.S. military planes — even if they're not in North Korea's airspace. Because the United States declared war, even if U.S. strategic bombers do not intrude into our air, we will possess the right to respond in self-defense, including the right to launch at a random time and drop [the strategic bomber]." Of that flight, Pentagon spokesperson Dana White said, "This is the farthest north of the Demilitarized Zone any U.S. fighter or bomber aircraft have flown off North Korea's coast in the 21st century." "The United States has not 'declared war' on North Korea. We continue to seek a peaceful denuclearization of the Korean Peninsula. The dispute between the leaders of the U.S. and North Korea has taken on a decidedly personal tone lately — as when Trump called Kim Jong Un "Rocket Man" during a speech at the U.N. on Tuesday. The president also said he would "totally destroy" North Korea if the U.S. had to defend itself or its allies. In response, Kim issued a long statement in which he took the rare step of using the first person — and in which he vowed, "I will surely and definitely tame the mentally deranged U.S. dotard with fire."